Shortly after announcing a massively successful launch in South Korea, selling half a million phones in just 40 days, LG has its highly anticipated Optimus G Pro all set to launch abroad, and the first stop on the list is just a short flight away to Japan, where the phone just launched. 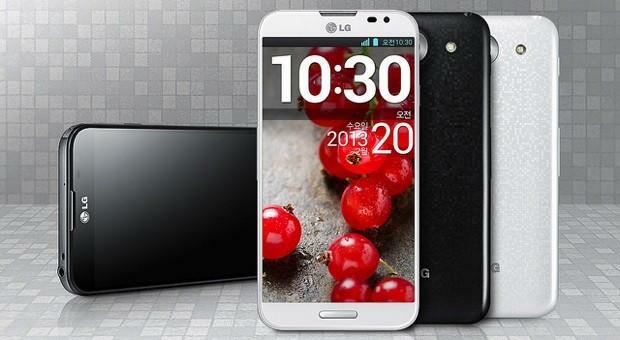 LG teamed up with NTT DoCoMo to distribute the phone to the Japanese market. Together, both companies have chosen to sell a variation rather than the full product reducing the screen just 5-inches rather than the much larger 5.5-inch display available in its home country. The screen still displays in 1080p and the rest of the impressive specs will be kept intact. LG now has to confirm whether the version coming to America and the rest of the world in Q2 2013 will be the 5.5″ screen or the 5″ screen, or maybe an entire different variation. I'm excited to check out this phone, but in Japan, I am a KDDI au subscriber and won't have the option to just yet with DoCoMo landing all of the best smartphone deals. SEOUL, April 4, 2013 – Following its successful launch in Korea, LG's Optimus G Pro is now available in Japan through NTT DOCOMO. The 5-inch Optimus G Pro — with Qualcomm's powerful Snapdragon™ 600 Quad-Core processor and Full HD IPS display — sports a smaller form-factor than the device that was launched in Korea last month, designed specifically for the Japanese market. The Optimus G Pro shows off its Full HD IPS Display with Zerogap Touch for the first time in the Japanese market. The large,5-inch (440ppi) display provides rich, crisp text, sharp images and wide viewing angles thanks to LG's display leadership demonstrated through the Full HD IPS and Zerogap Touch technologies. And with Qualcomm's advanced Snapdragon 600 at its core, the Optimus G Pro offers smooth and seamless performance unmatched in today's industry. Continuing the Optimus G design heritage, the Optimus G Pro maintains a subtle, yet attractive checkerboard-like pattern in the back as well as a minimum bezel to offer a comfortable one-hand grip. Optimus G Pro's esteemed design is complemented by its exclusive user experience (UX) functions, such as Dual Recording and VR Panorama. Dual Recording allows users to place themselves in a video as they record with the front and rear cameras simultaneously and VR Panorama provides a full 360 view of one's surroundings, not just a wide landscape view. Optimus G Pro comes with refreshed versions of innovative functions already popular among Optimus G users, including QSlide, QTranslator and QuickMemo. LG designed all of Optimus G Pro's functions with its Optimus User Interface (UI) in mind, which facilitates ease of use and simple device management. "The Optimus G Pro showcases LG's leadership in display technology with its Full HD IPS Display and differentiated UX functions," said Dr. Jong-seok Park, president and CEO of LG Electronics Mobile Communications Company. "With a combination of style and a unique mobile experience, Optimus G Pro carries on the premium heritage of the entire Optimus G series."